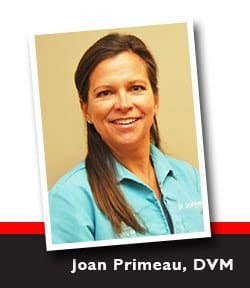 Dr. Joan Primeau is the proud owner of A Pet’s Place Animal Hospital. She grew up in Greenville South Carolina and obtained a Bachelor’s degree from the University of Georgia. A friend suggested she work a ski season in Vail and she’s been in Colorado since! 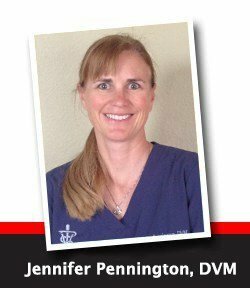 She obtained her veterinary technician degree from Colorado Mountain College and worked as a certified veterinary technician for eight years before pursuing vet school. She graduated from Colorado State University in 2000. Joan purchased the practice in 2008 and then relocated to a new facility in 2013. She enjoys the relationships that she establishes with her patients and their people. 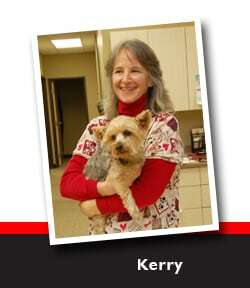 Her goal is to provide excellent veterinary care while offering workable treatment solutions. She loves acupuncture and alternative care, geriatric medicine and surgery. She enjoys spending time outdoors with her husband and two boys – doing hot yoga, skiing, mountain biking and watching soccer. She has an awesome dog Chip, a feisty cat Mitsy, a bearded dragon Aries, two budgies Dew and Blu, many fish, and a couple of frogs. Dr. Jennifer Pennington grew up overseas, spending the largest amount of time in Malaysia. She pursued her education at UC Davis in California, where she graduated with honors for both her animal science and veterinary degrees. She finished her internship in Colorado in 1999 and knew then that she wanted Colorado to be her home. After living in Colorado on and off for 12 years, Jenn and her family settled in Longmont where they fulfilled their dream to have a couple acres for their two boys and many animals to enjoy. Jenn loved reading James Herriot stories growing up, and strives to have that same personal relationship that allows her to know the individual personalities of all her patients. She has special interests in internal medicine, behavior, and senior care. Outside of work she likes to mountain and road bike and spend time with her family. She enjoys the outdoors and her latest adventure is training her miniature donkey, Cosmo, for a pack burro race. 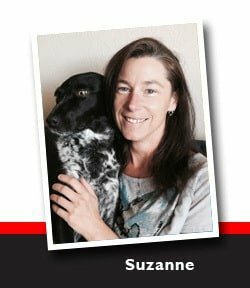 Suzanne graduated from Front Range Community College in 2014 with an Associates Degree in Veterinary Technology and is a member of the Colorado Association of Certified Veterinary Technicians. She is also a massage therapist with over 10 years experience in the field. She grew up in Canada but moved out to Colorado 12 years ago to check out a Buddhist retreat center. She lives with her sweet Border Collie mix, Tashi and a demanding, but lovable cat, Panther. She also enjoys riding her bike, hiking or hot yoga. 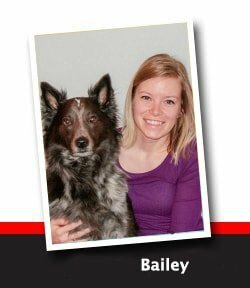 Bailey grew up in the California Bay Area before moving to Colorado in 2010 to attend University of Denver. After graduating she went on to work in the veterinary field for several years, including at A Pet’s Place as Receptionist/Veterinary Assistant. Bailey wanted to become a Veterinary Technician, so she enrolled in school at Bel-Rea where she earned her Associates and graduated with Honors. Bailey’s life is ruled by a crazy border collie/heeler mix named Rylee. In her spare time Bailey hikes, snowshoes and works on a variety of crafts. Kerry graduated from the Bel Rea Institute of Animal Technology. She has worked at A Pet’s Place Animal hospital since 2005. She brings a vast amount of expertise and compassion for the animals she cares for. In addition to working with animals, she also enjoys hunting, fishing, hiking, bicyling and playing bluegrass music. Holli moved to Colorado in 1998 from Ohio after falling in love with the state during vacation. She along with her husband have been Longmont residents since 2004. She has always had a love for animals and after 18 years of working as an orthodontic technician decided to change careers. She started volunteering at Longmont Humane Society in 2010, which quickly moved into her new career. Holli enjoys activities such as hiking, running, kayaking, (basically anything outdoors), traveling and spending time with her husband. Amanda was born and raised in Colorado. Between her Significant Other and herself they have 3 children and 3 dogs, Styx, Noreo, and Leelou. They also have two bearded dragons, Fred and Unsub. They often go hiking and camping together as a family, and also enjoy staying at home and playing board games together. 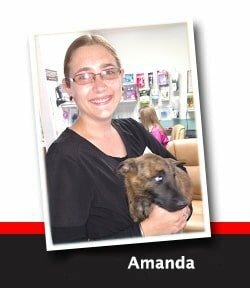 In her down time Amanda enjoys reading books and watching movies that are based on a true story.